Elephant populations in southern Africa’s national parks have increased dramatically in recent years. As a result of their booming numbers, vast dietary requirements and expansive ranges, elephants sometimes roam outside the borders of protected areas in search of food. Farmers in communities surrounding national parks rely heavily on subsistence agriculture for food and income. Unfortunately, when elephants venture into these human settlements, they cause significant damage to crops and property resulting in major financial losses to rural farmers. This behaviour, referred to as crop raiding, represents the root cause of human-elephant conflict throughout southern Africa. Farmers have resorted to a host of preventative measures to ensure that the elephants stay away from their property. These include the use of loud noises, fire, and chilli paste. Some may be effective in deterring raiding elephants, but there are drawbacks. They require constant vigilance; they can expose farmers to a charging elephant; they are labour intensive; and, in the case of chilli paste, require repeated application. A recent paper has proposed using a fabricated bee threat to deter elephants in South Africa’s Kruger National Park. Using African honeybees as an elephant deterrent is not a novel concept. Lucy King and colleagues have been toying with the idea in east Africa for some time now. They have found that audio playback of disturbed bee sounds can induce elephants to retreat. They have also found that beehive fences may prove more effective in protecting rural farmlands than traditional thorn fences. Despite these previous investigations, bees have never been used as a management tool in South Africa – until now. The recent study conducted experimental trials in the Kruger to assess the responses of wild African elephants to a bee threat. bee noise with honey scent. 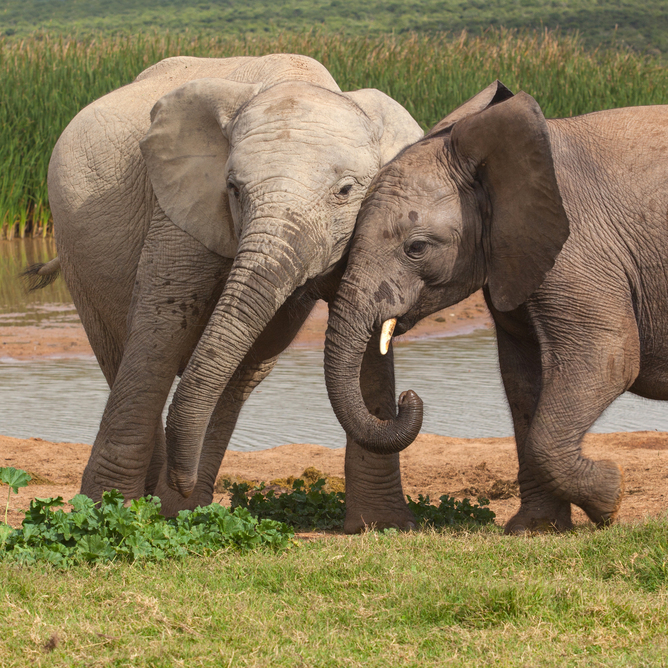 Elephant responses were classified into 11 possible behaviours, ranging from attentive to threatening. Elephants exposed to the mixed stimulus treatment of bee noise with honey scent displayed cautious and defensive behaviours. Fifteen of the 21 elephants fled the vicinity. But, on their own, neither the noise nor scent elicited an equally dramatic response. In other words, independent stimuli (angry bee noise or honey scent) did not adequately convince elephants of a realistic bee threat. Elephant curiosity was captured, but only for a brief moment, by the isolated sound of angry bees or the distant scent of honey. Neither induced an avoidance response. In previous east African studies elephants responded differently. They fled at the mere sound of bees. The discrepancy in responses between elephants in the east African studies and the South African study may be explained by the unique dynamics and pressures that characterise elephant populations in southern Africa. Elephant populations in east Africa are shrinking as a result of poaching and are also becoming more skittish and wary of disturbances in their environment. However, elephant densities are steadily increasing in protected areas throughout southern Africa. These dynamics may contribute to a more confident elephant population in South Africa, making them less susceptible to disturbance by an unconvincing bee threat. Ultimately, it makes sense that these intelligent animals would rely on multiple stimuli to assess risk and navigate their surroundings; managers must account for this as they move forward in developing effective elephant deterrents. Although isolated auditory and olfactory cues proved ineffective in deterring elephants in the Kruger Park, the success of the mixed stimulus treatment implicates live bees as a viable management tool. If South African elephants are not convinced by a fabricated bee threat, perhaps they require the real thing to induce a lasting avoidance response. The same researchers have embarked on answering this question in a current study in the Kruger National Park, with a particular focus on using beehives to selectively deter elephants from overly utilised watering points. Bees represent a promising tool for managing elephant movements with potential to contribute to long-term conservation of the species by offering an alternative to lethal management of problem elephants. Emma Devereux, who is a colleague of Dr Ndlovu, featured as a co-author of this article. This amazing footage was taken in Mala Mala in the Greater Kruger National Park in South Africa.